SAN FRANCISCO — Michael Morse hoped to bring a little levity to a battered clubhouse Wednesday. 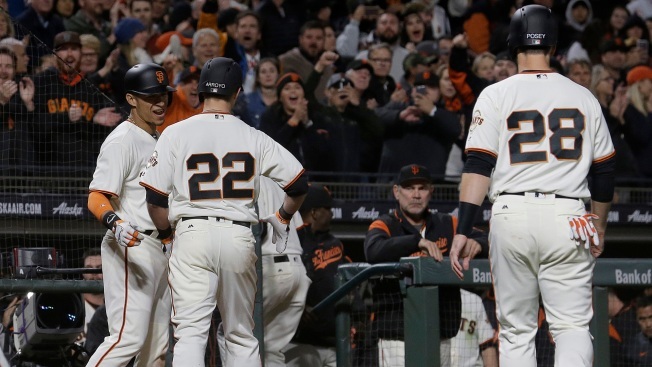 On his first day as a Giant since the 2014 World Series, he ended up bringing the most thrilling win of the season. Morse’s pinch-hit homer in the eighth shook AT&T Park and tied the game. His good friend Hunter Pence won it with a sacrifice fly in the 10th, giving the Giants a 4-3 win over the Dodgers. The 10th-inning rally started with Gorkys Hernandez’s single off Ross Stripling. Hernandez stole second and Conor Gillaspie drew a walk, and both runners were safe when Adrian Gonzalez went to third on Nick Hundley’s bunt. Pence flied out to deep left on the 10th pitch of his at-bat. The Giants had been 0-13 when trailing after seven. Morse helped change all that. Morse’s homer came an inning after Christian Arroyo’s first career homer. The newcomers saved a night that started with nothing but failure. The Giants entered with four games this month where they failed to put a runner on the first time through the order. Lefty Alex Wood stayed with the theme. Brandon Belt finally touched first with a one-out walk in the fourth but it wasn’t until the sixth that a Giant — Drew Stubbs — picked up a hit. By that time, the Dodgers led 3-0. Johnny Cueto worked around some early trouble but Corey Seager got to him in the sixth. The young shortstop led off with a mammoth blast on a 3-2 pitch that landed a couple dozen rows up in left-center. The homer was tracked at 462 feet per Statcast, tied for the longest in the Majors this season. The Dodgers went up 2-0 when Chase Utley blooped a single to left with the bases loaded. Utley was 1-for-31 at the time. Andrew Toles beat out a grounder to bring home a third run. The Giants looked dead in the water, but Wood — the Dodgers’ swingman — was pulled after 77 pitches and old friend Sergio Romo immediately opened the door. Buster Posey hit a one-out single and Arroyo lined a slider just over the fence in left-center. Morse’s first at-bat as a Giant in three years sent an even bigger charge through the park. He got a 97 mph fastball from Pedro Baez with two strikes and blasted it to left. Morse held his arm up right away and screamed as he rounded first. Starting pitching report: Cueto was charged with three runs on seven hits and two walks. He’ll finish April with a 5.10 ERA and 1.40 WHIP. After holding opposing hitters to a .238 average last year, he’s getting hit at a .271 clip this season. Bullpen report: Steven Okert did a great job of settling the place down, throwing a scoreless inning before Arroyo’s homer and retiring two more immediately after. At the plate: The 21-year-old Arroyo calmly clapped his hands once as he rounded first. He was pushed out of the dugout for a curtain call as the park roared. Most impressive of all, his mom, Kimberly, didn’t drop a single nacho as she celebrated in the stands. In the field: Stubbs made a diving catch to open the seventh and Gorkys Hernandez followed with a nifty sliding catch at the wall. Attendance: The Giants announced a crowd of 41,572 human beings. Thursday will be the 500th consecutive (announced) sellout. Up next: Matt Moore (1-3, 5.87 ERA) will try to turn his month around. The Dodgers will trot out young lefty Julio Urias, who spent three weeks in the minors to control his innings count.